Minecraft players can finally know the meaning of haste. The latest snapshot update to Minecraft is here, and as usual, it brings with it a bundle of block-shaped gifts. First and foremost among them is the addition of horses, as teased by head developer Jens Bergensten a while ago. 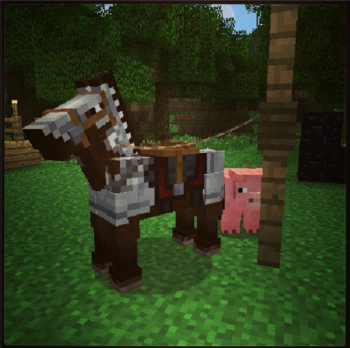 Mojang wasn't afraid to give credit where it was due, either, acknowledging the fact that the official horses were inspired by the implementation of horses in DrZhark's popular Mo' Creatures mod. Horses are just one part of the animal-friendly update, with new leashes allowing you to tame other animals as pets, and wool carpets to ... alright, the animal theme kind of ends there, but the carpets are cool too. Horses can be found in the wild, but you won't just be able to hop up onto any stallion you see. Once you climb on, it'll do its best to buck you right back off again. Persist for a while, and eventually you'll earn its respect. At that point you can saddle your new mount and ride into the sunset (time of day allowing). You can even equip your trusty steed with horse armor at no additional cost! Leashes will be a handy addition for those interested in befriending the blocky animals of the wild. By leashing any non-hostile mob, you can lead them around at will (yes, even squid). You can also tie your new slaves friends to fence posts to make sure they don't wander into any roaming creepers. You can never be too safe. On the less visible side of things, some serious changes are coming to Minecraft's technical infrastructure. The game is upgrading from Java 5 to Java 6, and although that's just a different number to most people, it means a colossal overhaul to the game's core technologies. It also bumps up its minimum required version of OpenGL from 1.2 to 2.0. The end result of this is that you may not be able to handle Minecraft if your computer is a decade or two old, but for the rest of us it'll mean a noticeable boost to performance. The new snapshot is available to check out right now, but it'll be a while before these updates make their way to the active build of the game - the new program architecture could lead to a good number of bugs that are best caught before the masses make the jump. You can grab the new launcher from Mojang's website here if you're eager to saddle up.